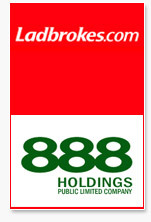 Ladbrokes has recently broke off talkins to purchase online gambling firm 888 Holdings (owner of the 888.com site and many others), citing an uncertain environment in the US and worries about potential liabilities as reasons why the acquisition couldn't move forward. The deal was expected to be worth somewhere in the $800 - $900 million dollar US range. Both companies have said that they intend on remaining friends going forward, and that they are both confident about their organic growth strategies going forward. Analysts following the talks said that the breakdown highlighted the complex environment in which online gambling firms attempt to negotiate deals, as firms want to avoid exposure to US players and the liabilities that may arise from serving American players, whether now or in the past.